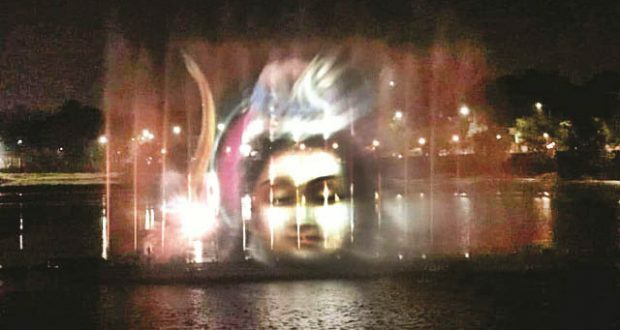 Bhubaneswar:29/10/18: The musical fountain and multimedia laser show conducted in the Bindusagar lake here last evening tingled the viewers, describing the history of great Kalinga. The entire lake looked colourful and was resounded with chantings dedicated to Lord Shiva, the presiding deity of the centuries-old Lingaraj Temple. According to reports, the Rs 9-crore-project was functional in view of the tourists spending the quality evening in the city to tell them the story of Odisha within a brief period of time through attractive lights, music and colours. Arrangements have been made by the Tourism department for smooth conduct of the show every evening. The authorities are also planning to make the show the functional in Odia, English and Hindi languages. A committee headed by noted film director Sabyasachi Mohapatra has been set up to decide the time duration and select the artists for voice in the light and sound show.